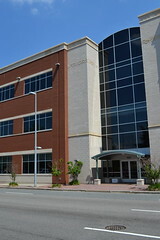 Opened in 2008, BioTech Eight is a three-story, 76,000 square-foot, multi-tenant wet/dry laboratory, office, and flex space that is part of the Virginia BioTechnology Research Park. One such tenant is Health Diagnostic Laboratory, Inc. (HDL), which seeks to provide personalized treatment plans for individuals with diseases through laboratory testing; such diseases may include heart failure, stroke, and metabolic syndrome (MS). There is also the VCUHS HLA and Immune Monitoring Lab, which tests the compatibility of organ donors and MCVH patients in need of transplants. The building is also certified under the LEED Core and Shell program by the U.S. Green Building Council. Insulted Concrete Forms (ICFs) or hollow Styrofoam blocks were used to form the walls of the building. The forms are filled with steel-reinforced concrete to create a sound structure. ICF's offer greater durability than traditional framed structures and can reduce the cost of operating HVAC in buildings by up to 40%.